A BPrintJob object runs a printing session. It negotiates everything after the user's initial request to print—from engaging the Print Server to calling upon BViews to draw and spooling the results to the printer. It also handles a secondary and somewhat separate matter related to printing—configuring the page layout. Users typically don't decide how a document fits on a page—the size of the paper, the width of the margins, the orientation of the image, and so on—each time they print. These decisions are usually made when setting up the document, perhaps from a Page Layout menu item, rather than Print. ConfigPage() has the Print Server interact with the user to set up the page configuration. Configuration settings are stored in a BMessage object that will be handed to the server when the document is printed. The BMessage is important to the server, but the application doesn't need to look at it directly; functions are provided to access the useful data it contains. However, you may want to get the object and store it with the document so that the configuration can be reused whenever the document is printed—and so that the user's previous choices can be the default settings when ConfigPage() is called again. This is good behavior for an application to follow, and is highly recommended. In this example, the setup BMessage presumably is flattened and saved with the document whenever the document is saved, and unflattened whenever the document is open and the page settings are needed. Engaging the Print Server and setting parameters for the job. Setting up a spool file to hold image data. Asking BViews to draw each page. After each page is drawn, putting the data for the page in the spool file. Committing the spool file to the Print Server. A BPrintJob object has member functions that assist with each step. So far, this looks much like the code for configuring the page presented in the previous "Setting Up the Page Layout" section. The idea is the same. ConfigJob() gets the Print Server ready for a new printing session and has it interact with the user to set up the parameters for the job—which pages, how many copies, and so on. It uses the same settings BMessage to record the user's choices as ConfigPage() did, though it records information that's more immediate to the particular printing session. Again, you may want to store the user's choices with the document so that they can be used to set the initial configuration for the job when the document is next printed. By calling Settings(), you can get the job configuration the user set up; SetSettings() initializes the configuration that's presented to the user. Information about the page layout will be required while printing. If that information isn't available in the Settings() BMessage, ConfigJob() will begin, in essence, by calling ConfigPage() so that the server can ask the user to supply it. The next step after configuring the job is to call BeginJob() to set up a spool file and begin the production of pages. After all the pages are produced, CommitJob() is called to commit them to the printer. BeginJob() and CommitJob() bracket all the drawing that's done during the job. DrawView() calls the BView's Draw() function. That function must be prepared to draw either for the screen or on the printed page. It can test the destination of its output by calling the Draw() IsPrinting() function. Don't use the BView::Bounds() function to determine the area to render. Instead, use the update rectangle passed to the BView::Draw() function. This function puts together all the above code snippets and handles the printing of a document (minus the actual drawing and visual status information presented to the user as printing goes on). // creates its own BPrintJob object). // WARNING: here, setup CANNOT be NULL. // Cancel the job if needed. // Now, you just have to commit the job! When a BView draws for the printer, it draws within the printable rectangle of a page—a rectangle that matches the size of a sheet of paper minus the unprinted margin around the paper's edge. 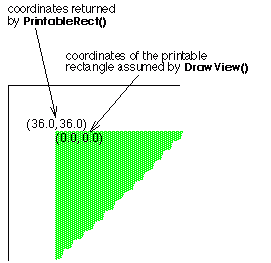 The PaperRect() function returns a rectangle that measures a sheet of paper and PrintableRect() returns the printable rectangle, as illustrated in this diagram. Both rectangles are stated in a coordinate system that has its origin at the left top corner of the page. Thus, the left and top sides of the rectangle returned by PaperRect() are always 0.0. PrintableRect() locates the printable rectangle on the paper rectangle. However, DrawView() assumes coordinates that are local to the printable rectangle—that is, an origin at the left top corner of the printable rectangle rather than the paper rectangle. 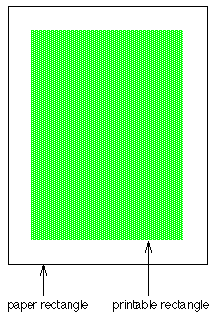 The diagram below shows the left top coordinates of the printable rectangle as PrintableRect() would report them and as DrawView() would assume them, given a half-inch margin. Draw() always draws in the BView's own coordinate system. Those coordinates are mapped to locations in the printable rectangle as specified by the arguments passed to DrawView().